Windows 8 for $39.99 — Are You In? Something that is known throughout the geek world is to never upgrade your operating system immediately after a new one is released (two words, Windows Vista). The new and shiny aspect of a fresh operating system are tempting for many, but is the benefit of being the first kid on the block with it, worth the hassle of the initial bugs that come with it? Those who saw the new interface of Windows Vista and thought “ohh, that looks cool” soon learned after they installed it that they were in for a nasty surprise. To this day, Vista is still considered to be one of the worst operating system to ever be released by Microsoft. I remember the strangest things happening to my laptop and even my manufacturer couldn’t help me. Eventually, some patch came out and fixed it, but the initial “coolness” factor was lost after the first few dozen bugs made themselves known. I will admit that Windows 8 has me curious. I wonder how much of a change users coming from Windows 7 will see as well as the changes an XP user will encounter. The biggest change, at first glance, is the Metro interface. The new interface makes me think of a touch screen computer or a windows phone. If this change feels a little scary, take comfort in the fact that you can switch it back to a traditional desktop style. 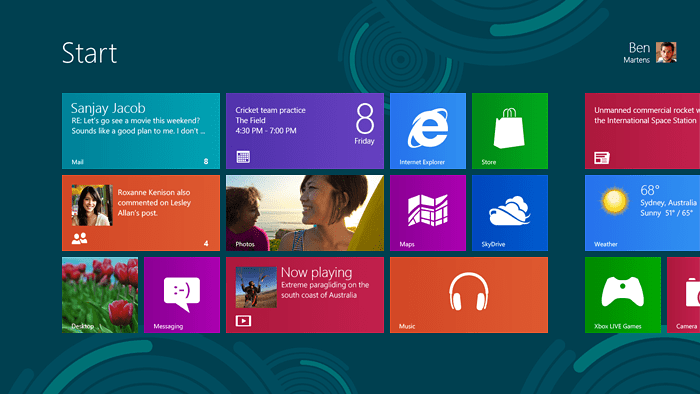 In comparison to Windows 7, the performance of Windows 8 appears to be better in some areas. Depending on the system, I’ve read that the boot up time can be cut from anywhere between ten seconds to thirty seconds. Even the Task Manager has been given a face-lift and is now a dashboard like setup, a big plus for anyone who uses it multiple times during the day. Microsoft has also removed some well known features. Windows Aero, Glass, and Flip 3D are also gone, as well as the Media Center. Windows Media Center doesn’t surprise me, because so few people use it. It’s worth noting that if you do use the Media Center, you can install it manually. Probably the most suprising of the missing features in Windows 8 is the start button and menu (features that have been around since Windows 95). Now, you will have to hover your mouse over the bottom left hand side to reveal a hidden start button. I think this is going to be the biggest adjustment for users. I might go ahead and just bite the bullet and upgrade my work pc to Windows 8. Since, I’m the only one that will be using it, it will give me something new to learn when I’m waiting for downloads to finish. For home, I can safely say that Windows 7 will be sticking around for a while. While some of the changes might not seem that big to some users, I can already hear my husband freaking out over trying to locate iTunes and the internet. For anyone who will be upgrading from Windows XP to Windows 8, I would suggest you go ahead and pre-order the Windows 8 For Dummies Guide now.